Announced on Sept. 24, 8th Gen Intel® Core™ desktop processors are available to purchase starting today. Offering a range of performance options for consumers, including unlocked “K” processors at each Intel Core brand, the 8th Gen Intel Core desktop processors are built for those who require premium performance: gamers, content creators and overclockers. 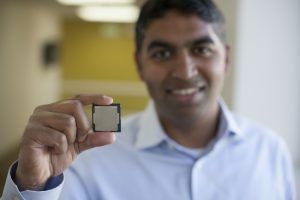 The new desktop processor family includes the new 8th Gen Intel Core i7 processor, which is the best desktop gaming processor ever from Intel1 , along with the first-ever 6-core Intel Core i5 desktop processor and 4-core Intel Core i3 desktop processor. These processors deliver frame rate improvements of up to 25 percent2 compared with 7th Gen Intel Core processors, enabling smooth gaming experiences. Content creators can expect 65 percent faster editing3 compared with a 3-year-old machine. HWBOT, the authority on regulating international overclocking competitions and rankings, was fast at work to document overclocking4 records with two total world records and nine global first-places for the 8th Gen Intel Core i7-8700K processor. The 8th Gen Intel Core desktop processors are available through multiple retailers, along with new Intel Z370 chipset-based motherboards from all major motherboard manufacturers. 1 As measured by a sampling of AAA game titles using the games’ benchmark mode measuring frames per second (FPS) on Intel Core i7-8700K processor. 4 Altering clock frequency or voltage may damage or reduce the useful life of the processor and other system components, and may reduce system stability and performance. Product warranties may not apply if the processor is operated beyond its specifications. Check with the manufacturers of system and components for additional details.